“Nevermore” by Abbey Armbruster, an 11th grade art student at St. Paul’s Episcopal School. Every February, the Mobile Arts Council hosts the Visual Arts Achievement Program (VAAP) and Young at Art. 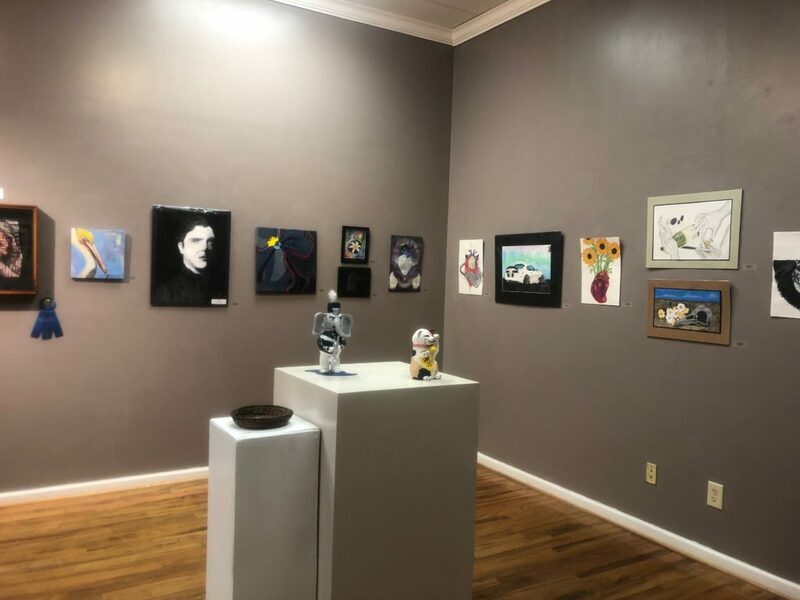 VAAP is an arts in education program of the Alabama State Council on the Arts, and it awards students in grades 6 through 12 that are participating in arts programs within their academic institutions. Young At Art is a display of elementary visual arts talent (and those ineligible for VAAP) from District 1 schools. Our judges for this year’s VAAP were Allison Shaub, Cat Pope, and Lisa Warren. All first place and judge’s choice winners will advance to the statewide competition in Montgomery. The show will be available to see during our gallery hours, between 9 AM – 4 PM on weekdays through February 21. This year, 17 District 1 schools are participating in the competition, including Baldwin County Virtual School, Bay Minette Middle School, Bayside Academy, Bryant High School, Causey Middle School, Covenant Christian School, Cranford Burns Middle School, Dunbar Creative and Performing Arts Magnet School, Fairhope High School, Foley High School, Gulf Shores High School, Mary G. Montgomery High School, Monroe Academy, Snook Christian Academy, St. Paul’s Episcopal School, Theodore High School, and UMS-Wright Preparatory School. Teachers include Catherine Black, Austin Boyd, Leigh Brown, Pamela Jones Coffman, Linda Duffis, Vikki Finch, Haley Hall, Pier Hardin, Catherine Helmsing, Melissa J. Hinton, Carrie Jackson, Jeff Knighton, Julie Kogon, Christy LeGros, Karin Marrero, Esther McNellage, Rich McCracken, Starla Morris, Felicia Olds, Christine Olsen, Jessica Peppers, Anne Rose, Terri Jean Smith, Kristy Snell, Melissa L. Stuart, Darla Wheeler, Lynda Williams, and Amanda Youngblood. 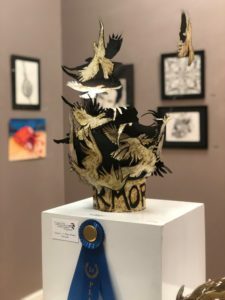 Young at Art has over 19 participants, including Bayside Academy, Collins-Rhodes Elementary, Covenant Christian School, Dawes Intermediate School, Delta Elementary School, E.R. Dickson Elementary School, Foley Elementary School, Pearl Haskew Elementary, Mary B. Austin Elementary School, Meadowlake Elementary, Morningside Elementary School, Old Shell Road School of Creative and Performing Arts, Perdido Elementary School, Pine Grove Elementary School, private students of Stephanie Bromley, Rockwell Elementary School, Snook Christian Academy, St. Paul’s Episcopal School, and Whitley Elementary School. Teachers include Monica J. Beasley, Cindy Becker, Pamela Jones Coffman, Haley Hall, Warren Jackson, Tarin Majure, Karin Marrero, Jessica Peppers, Cindy Robles, Ella Smith, Kristy Snell, Tracy Wilhelm, and Amanda Youngblood.